Aye, that middle image girl's face is great, and I really like the wrap in the back dress with the orange shoulders from the first image - right side. Now I can delete my screen caps. These are fabulous just for being tests. I'm looking at the white-haired one in the third image on the right - I like the idea of a very ethereal girl with white hair, who shares that quality with the birch itself. I also love the determined look on the girl's face. She has the expression of a thoughtful hero to me, looking out with determination to where she's heading. Of the drawings you've made, I'd love to play as her the most and identify with her the most. Cool. I love the butterflies flitting about her head. 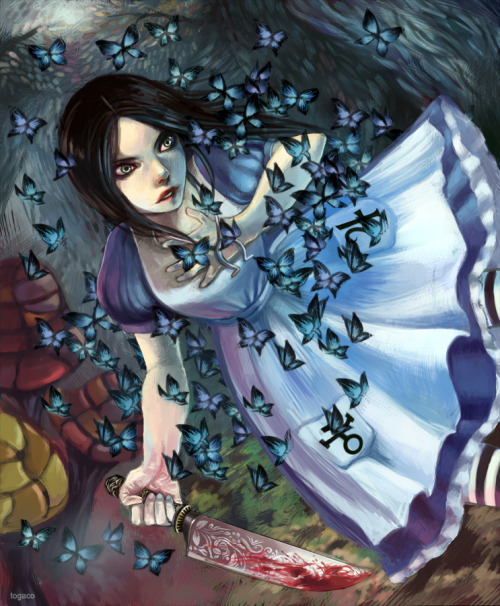 May want to take care so as to not look too similar to American McGee's Alice, though. I especially like the face and hair of the top-left drawing, as well as the mid-right and bottom-right ones. Disney's Alice in the Wonderland, is a wonderful and great concept of how "mad" things can get but still extremely lovable. I love the dresses set upon the girls and I find the details to be really nice for her. I really like the wrap in the back dress with the orange shoulders from the first image - right side. +1 Only need to add that that dress looks a bit uncomfortably tight for doing platforming. Girl02's freely flowing style dress would be a lot more practical while climbing the tower. And top-back+front-down mix of both would be great. Girl03 left looks like a good mix of needed. I am digging Girl one with the blue dress/no butterflies . For some reason I can't get around the knots and elaborate dresses on the other girls.. I like the idea of simple hanging shoulder straps. Very cool, thanks for sharing after watching the live stream as it happened. Yeah, the butterflies definitely read like Alice especially when they're blue. 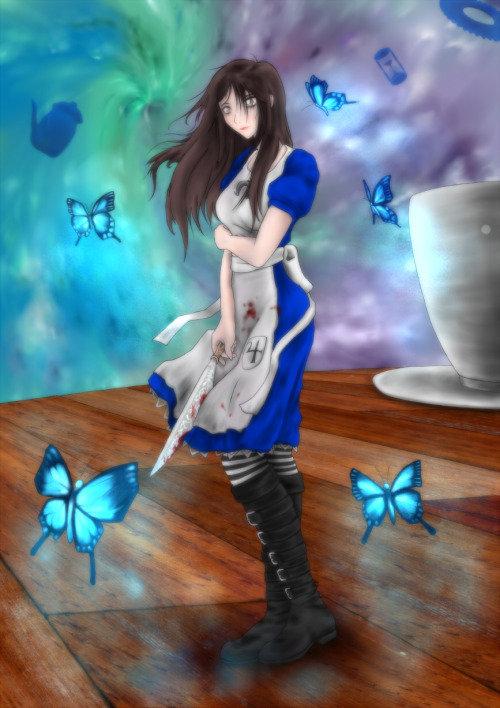 Alice had those effects when she jumped. and when she died. I think you can get away with it if the butterflies are pink or if you use a different bug like a firefly. I personally don't dig the dresses because I can't imagine "climbing" in a dress, but the flow of the extra fabric always looks so nice. Leggings/shorts with oversided tops, tops, or cloaks seem like a good alternative. I understand the concern with the butterflies, but I think most of the difference will be how it's implemented. I don't think we're in danger of treading over what Alice did yet. Concept is about trying stuff! Not getting to hung up on "so-and-so used a fox so now I can't" type of thoughts. It's hard not to do though! If later we look on it and think its getting too similar or referential then we can step it back or change it. In terms of the nightgowns, I believe Andy feels it supports a timeless and dreamlike quality he wants to push. I agree with him that 30's & 40's nightgowns are a great way to do that. I'm not so sure this is a situation where she would have appropriate tower climbing clothes handy. If she's the type of girl who naturally climbs and adventures, she'd wear clothes & fabrics that were convenient for doing such. If she's in a dream, then the argument is invalid because she can dream to be wearing anything. A lot of fashion (more than just "nightgowns") creates a "dreamlike" quality. I'm not saying that the only answer is she can't wear a dress, but you shouldn't be saying the only answer is that she has to wear a dress. If she were a boy, it wouldn't even be an option-- what solution would you find if it were a boy? If art is really about trying stuff -- there's ideas other ideas to explore. Just to soften this post, I love you. I appreciate the comment Emirizilla. I don't think I implied that a dress was the only solution, just that it's the one we are pursuing. You have to look past technicality and look more at expression. While it might not be ideal to climb in long clothes & fabrics, and while you might wear anything in a dream (which isn't necessarily true, since it depends on your control of the dream), choosing the long nightgown look might be more a case of expression or mood, in which it looks past realistic tendencies. Looking past realistic tendencies might be a way to convey the "ideal", the "irrational" or the "unreal". I think a long dress just naturally seems better for the game, since it makes the climbing feel less like a triviality and might work better visually. Sometimes an artist just has to feel what is natural, instead of rationalizing. Re: buttlerflies/experimenting: That sounds reasonable enough. I wasn't sure if any of you had played Alice or were aware of the similarity, so pointed it out just in case. Nightgowns, eh... I do agree that it would be a cool look for a dreamy/atmospheric type game. 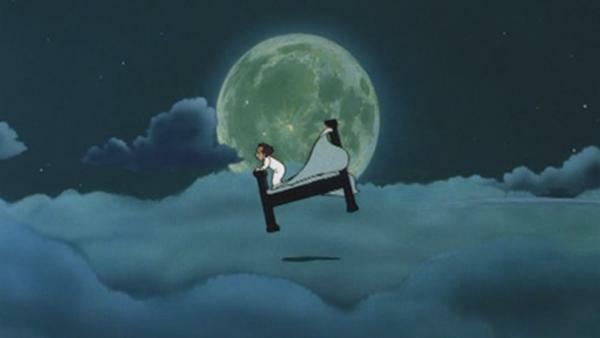 It kinda invokes a similar feeling of fantasy as Little Nemo when I think about it that way. Love the 2nd concept image, the far right blurred image reminds me of the type of colour palette used by Tara McPherson and I would love some more odd colours that don't scream toy town but also make it clear that Nature is not all that hold sway here [Well earth nature anyway ]. I'm really hoping influence from things like spirited away for that cute/insane DF vibe but maybe more of a more soft edge effect than DF traditional style as it is great but think that more horrific stuff can be done with less defined edges than with the line art style we see normally from DF. Glad I chipped in for both this and DFA and hope that if there is only 1 game to be made from all this that a few will have Kickstarters to get them made as I love 3 out of the top 5 as my favourite... (Never was any good at maths). 1st image, third girl from the left. 2nd image, second girl from the left, though the 4th girl seems more appropriate for the game. The butterflies are an interesting touch. Blue really suits them as a colour! I'm really digging the color palette and I like the juxtaposition of the beauty and raggedness. She looks like she's been through a lot, yet still maintains an ethereal quality about her. also the blues and purples are really nice and i really dig the mystical and mysterious companions.